Choosing the perfect material for your kitchen countertop is easier than you think! A kitchen remodel is often a daunting task, especially when tackled all at once. The price tag alone is enough to shy even enthusiastic participants away. Because of the almost constant functionality of a family’s kitchen, deciding how and where to devote money into upgrading this area is one of the most important decisions to make for your house to feel like a home. 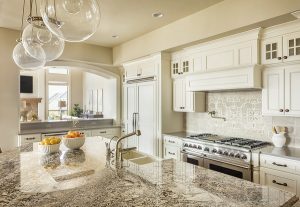 But more often than not, homeowners tend to skimp on their countertop upgrades because of the assumed luxury of materials like granite, quartz, and marble. The eyes are naturally drawn to the surface of countertops in any kitchen, which explains all those Pinterest articles about organizing them to avoid clutter. Why not invest? So many homeowners tackle accessories first – cabinetry, table, and chairs, appliances. By the time these ancillary concerns have been met, they are often left with minimal funds left to install countertops. The best way to budget for your new kitchen countertop is to start there. Decide what’s most important to you as a family. Durability, if you love to cook or have young children? Ideal baking surfaces, if that’s a hobby or a passion? Do you entertain frequently, or are you planning to upgrade to sell? How much of each type of surface can you afford, and how should you customize your design? Each need can be met with a different material, so if you can prioritize your needs early in the budgeting process, you will certainly be able to accommodate your lifestyle, even if it takes using several different sources throughout your kitchen! Don’t Let The Price Make You Settle! Certain materials make people nervous just at the sound of them – quartz sounds awfully expensive, doesn’t it? Just the tiniest bit of research proves that not only is it rather affordable, it’s resistant and easy to maintain. Granite, while not quite as easy on your wallet, can increase the value of your home and when used strategically, brighten up your countertop and repel bacteria. Marble, the baker’s friend, can be used sparingly and still make you feel like you’ve created the luxurious kitchen of your dreams. If You Ask for What You Want, You Just Might Be Able To Get It! If you never ask, you certainly won’t! At Rock Tops Fabrication, we use the latest technology to make sure that your surface is designed, cut, and finished exactly how you envision it, and we’ll always do our best to work within your budget. We’ve been in business since 2004, and we have been updating our services to better provide customers with quality products ever since. Rock Tops Fabrication has projects and success stories littered throughout Maryland and D.C.. Are you interested in quality, customized, beautiful fabrication? Contact us today! This entry was posted on Friday, May 26th, 2017 at 1:05 pm. Both comments and pings are currently closed.